Camp Alabama had a chance to catch up with Susan, owner of Talladega Creekside Resort resort, to talk about camping at Talladega Creekside Resort. She shared some insights about the resort, campground activities and the best places to camp at Talladega Creekside. 1. How long has Talladega Creekside Resort been there and how did it start? We bought the campground in January of 2007. The campground had been in operation very “loosely” for a couple of years but needed lots of TLC. When we bought the campground there were only 4 finished cabins….now there are 12 and soon to be 13. The prior owners had no camping experience whatsoever so there were many things that we just had to make “camper friendly”. Both myself and the other owner were raised in families that camped often so it was a pretty natural transition for us. 2. What are the most popular activities at the resort? Hands down the most popular activities at the resort center around our beautiful creek. We do kayaking, canoeing and tubing and that is a 6 month operation where it is very steady. We also have a lot of open space that is great for a game of touch football or Frisbee etc. The fishing is also very popular, to be a creek we have some really nice bass that call this place home. 3. 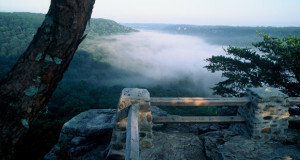 Where is Talladega Creekside Resort located? What are some other attractions in the area worth checking out? 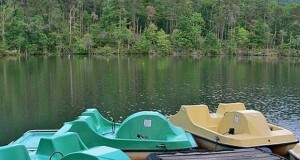 The campground is located in the county of Talladega, we are about 5 miles outside the city limits of Talladega. Of course the main attraction in our area is the super speedway, there is a NASCAR race here two times a year and that brings large crowds from all over the country. We are also located within 30 minutes of DeSoto Caverns which is a pretty neat cave located in Childersburg. There are a couple of very large ATV trails in the area and Cheaha mountain which is the highest point in Alabama is only 30 minutes away. There are several small waterfalls in the area and Talladega National Forest is right around the corner. 4. Do you have any group camping sites? We have a small campground, everything is located close to everything. The campground is on a 3 acre piece of land. We have lots of groups that come here from churches or family reunions etc that will rent out several of our cabins at one time so that everyone can get together and have plenty of places to sleep. We have had several weddings on the property and last summer we hosted the Alabama School for the Deaf alumni event and had 200 people on the premises. 5. What are the campsites like? Are they more open or secluded? 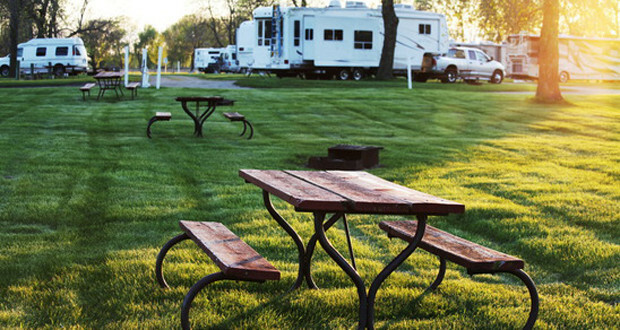 Our campsites are more open, gravel sites, grassy areas. Unfortunately the prior owners took most of the trees down. But, some folks like that so that they get good satellite reception. 6. If you could only spend one hour in the park, what would you do? I would kayak! The water is crystal clear in the creek that surrounds the area and you can see fish, turtles and beaver etc. 7. If you could spend just 1 night in Talladega Creekside Resort, which campsite would you choose – and why? If I were in a tent or RV I would choose site number 2, it does have a nice shade tree and that site is larger than most. If I were going to stay in a cabin I would stay in the Club House that has a large 16×16 private deck right on the creek with a beautiful view.